Ideal for middle and high school students. Buy a five year subscription to our Teacher + Unlimited Students and receive 20% off your order. To purchase, call 1-800-848-0256. New to Voces? Contact us and we'll set you up with a free trial, plus we'll walk you through many of the features and answer any of your questions. 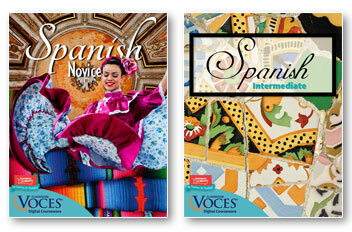 Voces® is the registered trademark of American Eagle Co., Inc., for print and digital textbooks and resources. “Capitán Español” and “¿Qué Piensas?” are trademarks of American Eagle Co., Inc. This work is protected by U.S. and international copyright laws. Unauthorized reproduction, including reproduction of the work in its entirety or in part, is expressly prohibited. Voces® may not be copied, duplicated, or stored on any server or electronic device. All Voces® content, unless otherwise stated, is copyright 2001–2018.